After calling Dundas and Church home for many years, Sabai Sabai moved into some new digs at Bloor and Church. If our visit was any indication, this was definitely a great move for them. 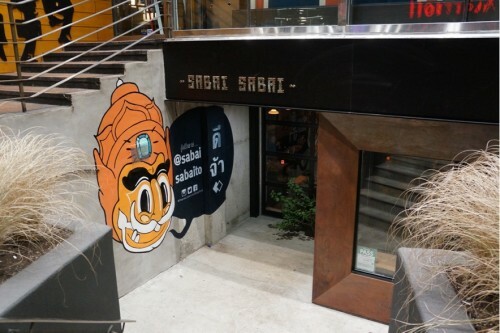 Despite having a great experience at Sabai Sabai several years ago, we had never been back. There just wasn’t much else in the Dundas/Church area so if we wanted to grab some drinks after dinner, there weren’t many options. Now that they are within walking distance of shopping, museums and bars, you can bet this will be the restaurant of choice in the area. We arrived at 8 on a Friday evening after visiting the Gardiner Museum (which, by the way, is half priced after 4pm every Friday!) and the restaurant was slammed. Reservations are highly recommended as walk-in’s were faced with long waits. Sabai Sabai is brought to us by Chef Nuit Regular and her husband Jeff, the pioneers of bringing great Thai food to the city. It all started out with Sukhothai on Parliament street, a hole-in-the-wall kinda joint. Fast forward eight years and Sukhothai now has three locations in the city, along with several sister restaurants including Pai and Sabai Sabai. The dishes at Sabai Sabai are served tapas-style, making them great for sharing. 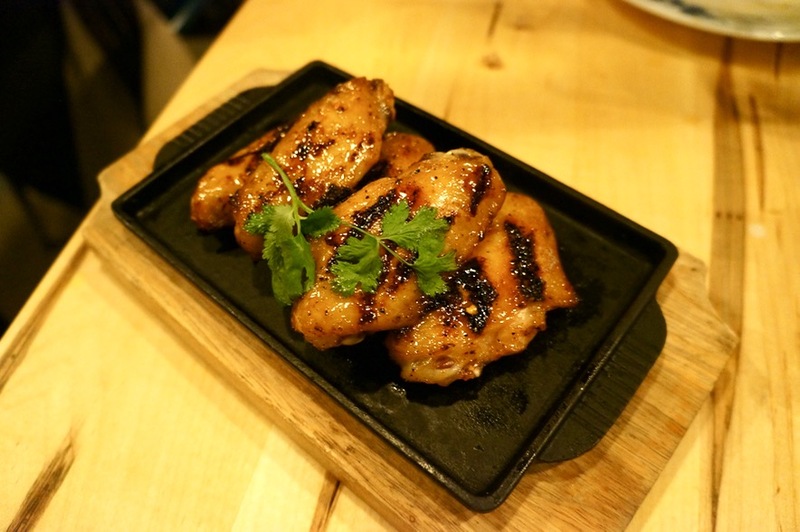 The menu is divided into small plates ranging from $9 for crispy fried fish to $13.50 for the grilled beef salad, large plates which include fried rice, curry and noodles ($13-$17) and sides which range from $5 for shrimp chips to $12.50 for squash fritters. 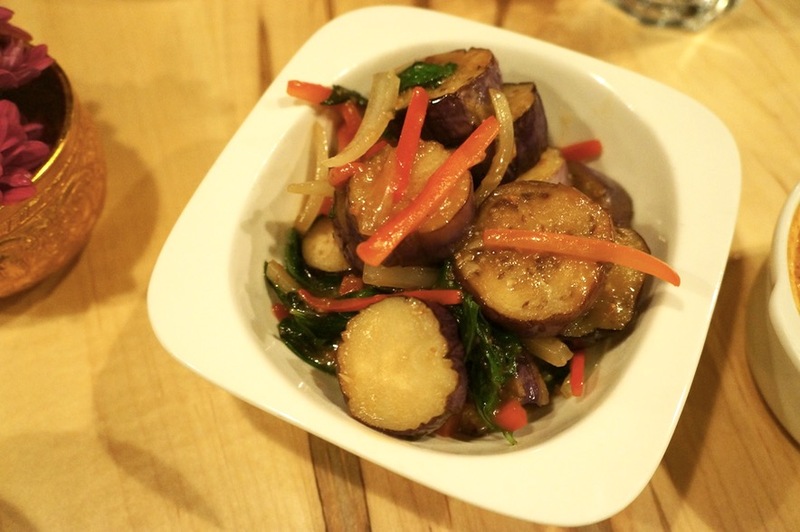 For some veggies, we ordered the Eggplant Stir-fry – Thai basil, red pepper, shallot ($10). We initially wanted to order the morning glory but they had sold out earlier in the day, which our server said has never happened before. Mike had been talking about morning glory all day so the eggplant had big shoes to fill. The eggplant had a very classic Thai flavour profile. The basil was very plentiful and I enjoyed its texture which held up quite well – not at all mushy. It was a good dish but we still would’ve preferred the morning glory. 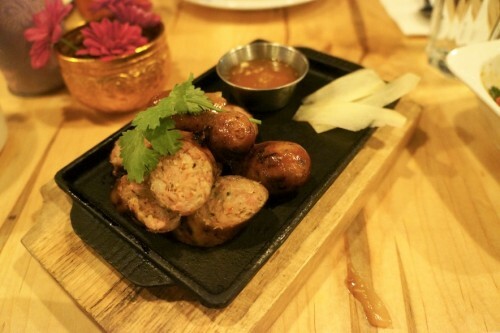 Up next was the Pork Belly Lao Sausage – with lemongrass, kaffir lime leaf, galangal, chili ($12). The sausage was served pre-sliced into several bite-sized pieces. It was quite rich which was as expected given that it was made with pork belly. It was tasty but I couldn’t eat more than a couple pieces due to its richness. One of our favourite dishes of the meal was the Laap Lao Minced Pork Lettuce Wrap – national dish of Laos with fresh herbs ($12). 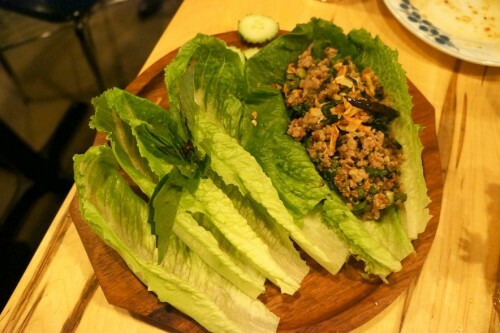 The mixture consisted of minced pork, shallots, cilantro, mint and toasted sticky rice which gave it a nice crunch. The mixture had a kick but wasn’t overly spicy. A little messy to eat but really damn tasty! The Lao Style Chicken Wings ($12) was another highlight of the night. Sticky, spicy and ridiculously tasty. My only critique would be that I wished they were a little crispier on the outside but otherwise they were excellent. For a more substantial dish, we ordered the Street-style Tossed Noodles ­– rice noodles, chicken, peanut, tamarind sauce ($13). If you order this, don’t expect a sweet pad thai-like dish. 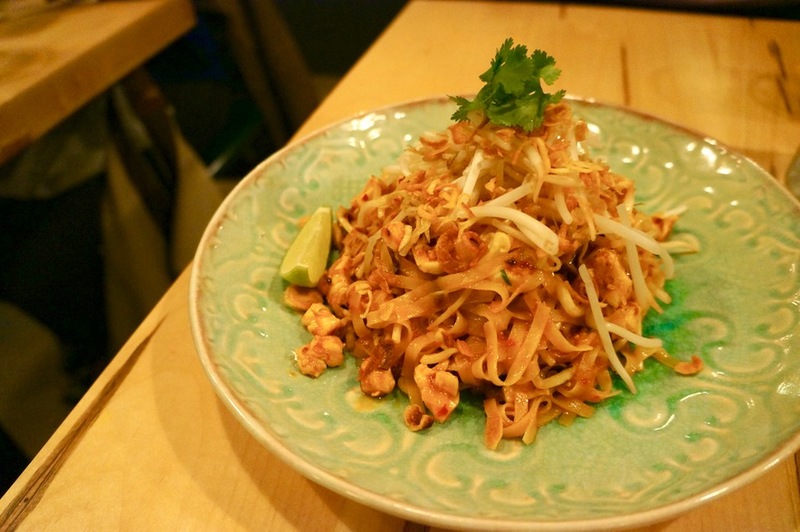 It’s much wetter and saucier compared to pad thai and doesn’t have that same sweetness. We really enjoyed these noodles except for the chicken. There were small bits of chicken sprinkled throughout the noodles which were really dry. I would’ve preferred it without the protein. 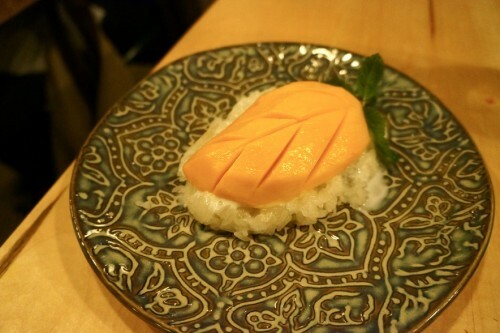 We had the Sweet Mango with Coconut Sticky Rice ($7) for dessert. Throughout the entire meal, I was really looking forward to this. It’s one of my favourite desserts. I loved the contrast between the cool mango and warm, sweet stick rice. A must-order, if you have room for dessert. 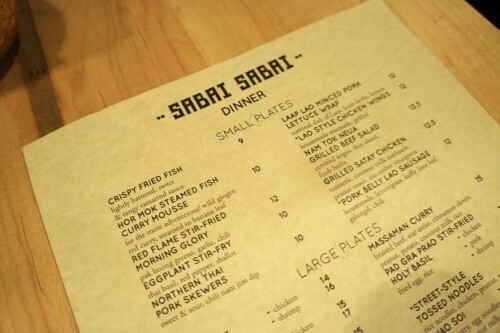 Overall, we had a great time at Sabai Sabai. 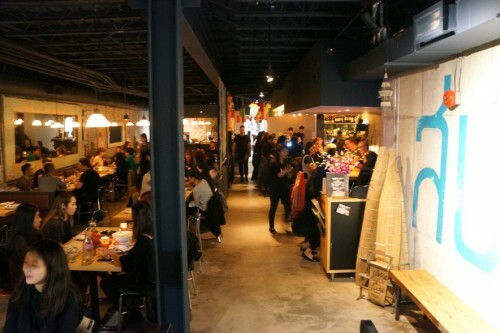 The food was tasty, the service was excellent and we loved the lively atmosphere. Chef Nuit and Jeff Regular’s restaurant journey in the city began back in 2008 and it doesn’t look like they’ve missed a beat!